MARIGNANE, France --- During a visit by the French Defense Minister Gérard Longuet to its facilities in Marignane, Eurocopter officially delivered the first NH90 Tactical Transport Helicopter (TTH) qualified in its final operational configuration to the French armament procurement agency today. Established in 1992, the Franco-German-Spanish Eurocopter Group is a division of EADS, a world leader in aerospace and defense-related services. The Eurocopter Group employs approximately 20,000 people. In 2011, Eurocopter confirmed its position as the world’s number one helicopter manufacturer with a turnover of 5.4 billion Euros, orders for 457 new helicopters and a 43 percent market share in the civil and parapublic sectors. 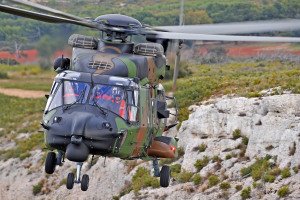 (EDITOR’S NOTE: Defense Minister Gérard Longuet announced during his speech that France is to order a second batch of 34 NH90 tactical transport helicopters for the French army, in addition to the 34 army versions and the 27 NFH navy versions already on order. Both are known as Caiman in French service. Longuet later told defense-aerospace.com that the order is to be formally awarded “in a matter of days,” at a unit cost “of the order of 20 million euros each.” With spares and support, the contract’s value could easily exceed 800 million euros. The first French army regiment equipped with the NH90 will be fully operational in 2013, according to a senior Army representative attending the ceremony. NHI is pleased to announce the delivery of the first NH90 tactical transport helicopter to the French DGA (Delegation Générale de l’Armement). This event took place according to the contractual schedule, in Marignane Eurocopter facility, where the helicopter has been produced. The NH90 TTH delivered is the first FOC (Final Operational Capability) qualified standard delivered to a NAHEMA member. It is the first aircraft of a batch of 34 helicopters ordered in 2007 to replace the venerable Pumas in the ALAT (French Army Aviation). When delivered, the NH90 TTH Caiman will join the Gamstat unit in Valence, where it will be used for training and evaluation. For the French Army, the NH90 represent quantum leap in terms of versatility and technology. They will cover a wide spectrum of missions such as Utility, transport, Combat Search and Rescue, Medical Evacuation, special operations and counter terrorism operations. The NH90 features a fully integrated weapon system enabling the helicopter to fly in the most demanding operational conditions by day or night. The NH90 TTH is fitted with a complete self-protection suite and a NATO interoperable communication system for international operations. It can operate from ground bases or military ships. The NH90 is the most successful European helicopter programme ever. Firm orders have been placed by 14 countries including France, Germany, Italy, The Netherlands, Portugal, Sweden, Finland, Norway, Greece, Spain and Belgium in Europe, as well as Australia, New Zealand and Oman overseas. The NH90, developed in the TTH utility transport and NFH naval versions, proves the ideal solution to meet requirements from many potential additional customers worldwide for a number of duties. The NH90 programme is managed by NAHEMA (NATO Helicopter Management Agency) representing France, Germany, Italy, The Netherlands and Portugal, and by the NHIndustries industrial consortium comprising AgustaWestland (32%), Eurocopter (62.5%), Fokker (5.5%).